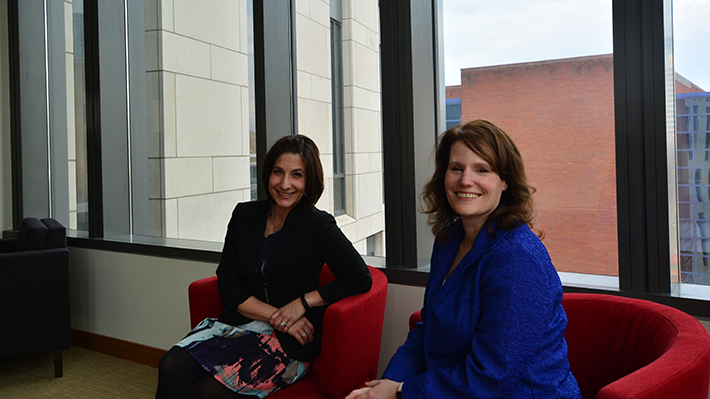 When Lisa DeLuca, director of undergraduate career services, heard she had won the fifth annual Drexel University Assessment Award, she was no less than surprised. Having worked with the UNIV B201 Career Management capstone course since 2008, seeing the class progress seemed like a byproduct, and the changes, common sense. Chosen from among eight finalists, DeLuca won the provost-level award with Teresa Harrison, associate dean for academic affairs and associate professor of economics, for being able to seamlessly incorporate the Association to Advance Collegiate Schools of Business (AACSB) “Assurance of Learning” component into the course with demonstrable results. The one-credit, writing-intensive course requires students to meet the goal of integrating academic and experiential learning during their time at the University. The course originally sought to meet this goal with three objectives including identifying their skillset for future work experience, presenting and showcasing their skills, and creating a career action plan. After noticing that students were struggling in the interview portion of the course and facing difficulty with their college portfolios through iWebFolio, Harrison and DeLuca reviewed ways in which the course could be improved, and made structural changes that saw students go from struggling to excelling. The interview portion was originally a 10-minute presentation at the end of the course that then was changed to a video project. “Some of the brainstorming on that came from logistical constraints but it was also very much informed by our conversations about how first round interviews are often now done by video – Skype or some other form of technology,” said Harrison. Overall scores weren’t the only thing that changed. Through the course DeLuca says she’s seen a drastic change in students’ career outcomes, especially with the shift from iWebFolio – an online portfolio website – to LinkedIn. “They had four portfolios: business, writing, math and career. The theory was in senior year, they would create their career portfolio building on everything that they’ve learned,” said DeLuca. But noticing a lack of engagement with employers and a dip in student portfolio performance in their sophomore and junior years, DeLuca decided LinkedIn may be a better avenue for students to showcase their skills and experiences. “We saw that employers weren’t really looking at portfolios in that way, and we wanted students to be able to share something that really made an impact with employers,” said DeLuca. Despite the drastic shift, DeLuca was shocked by the win because she’s not a member of the faculty. “I’m not an academic, so it’s an interesting process to learn how to develop a course and keep revising it. I wouldn’t think I’d be doing that, but it’s been a lot of fun,” said DeLuca. A team of eight Drexel Accounting students analyzed the costs at the Mutter Museum to create a decision-oriented income report for the museum’s growing gift shop.